Haunted Mississauga Heritage Tour: An Annual Tradition! 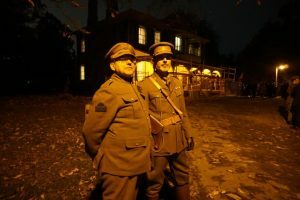 The 17th annual Haunted Mississauga evening took place on Saturday, October 20th, 2018 at Benares Historic House in Clarkson. 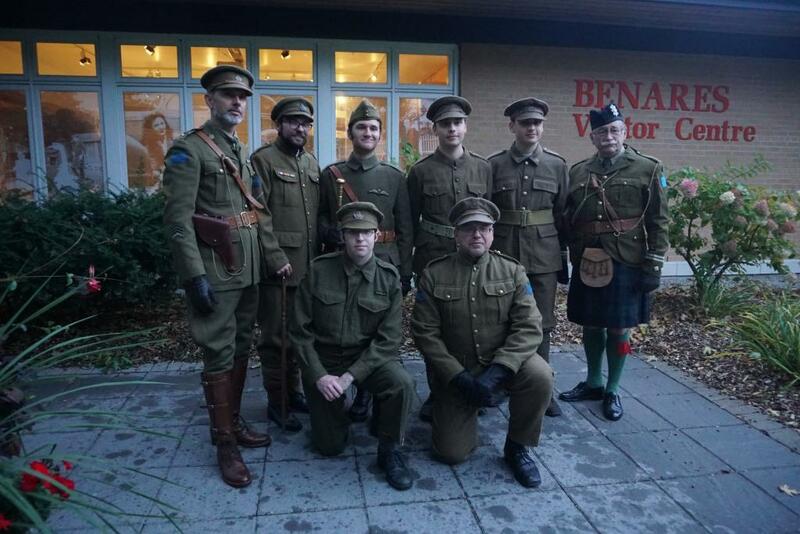 The evening was themed on a First World War Victory Party, and visitors were treated to stories from our past, featuring in-character actors portraying people from our past. 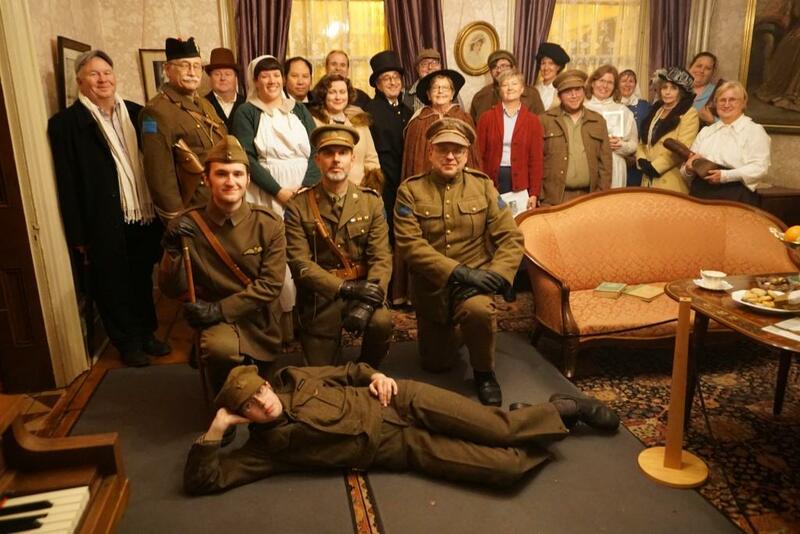 In our story visitors had the opportunity to “meet” many people from our city’s past, as they are portrayed by our volunteer cast of actors. 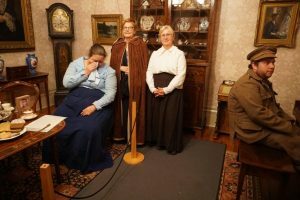 The actors are each given a factual biography of the person, a background on their life and times based on the historical information that we have, and the actors are then asked to “become” that person for the evening. They do so respectfully, and with humour, but also try to stay true to the storyline of the evening. However, nothing is scripted and all of the actors’ interactions, with each other, with the tour guides, and with the audience, is live improvisational theatre! Haunted Mississauga would not happen each and every year without the support and enthusiasm of our “Spirit Team”. Thank you Heather Boden, Phil Booker Sr., Greg Carraro, Yvonne Carraro, Lindsay Doren, Gord Fergusson, Merri Fergusson, Scott Foster, Jayme Gaspar, Les Gaspar, Bryan Ho, Bert Jagoda, Max Jagoda, Olga Kalynowysh, Meghan Mackintosh, Denise Mahoney, Nicole Mair, Scott Mair, Fran Murphy, Kelly Ralston, William Ramalheiro, Becky Rusk, Cameron Scott, Rob Smol, Rob Stanczyk, Hope Wickett, Amy Wilkinson, Matthew Wilkinson, Paula Wubbenhorst and Joe Zammit. Special thank you to our event partners: the Museums of Mississauga and Thompson’s Company (2nd Regiment of York Re-enactment Company). This evening would not be possible without their support! Are you interested in participating in future Haunted Mississauga events? Please contact Heritage Mississauga for more information. No experience necessary! The date and location for the 18th Annual Haunted Mississauga heritage tour will be announced in early 2019. Contact history@heritagemississauga.org or 905-828-8411 ext. 29 for more information.